Most board partner variants of Nvidia's GeForce 10 series products don't vary significantly, often packing small factory overclocks and very similar cooler designs. EVGA's new graphics cards are a little different: they offer closed-loop liquid cooling, replacing a tri- or dual-fan air-cooled design. The EVGA GeForce GTX 1080 and GTX 1070 Hybrid cards use a similar closed-loop liquid cooler design, which dissipates most of the GPU's heat in an external 120mm radiator. The cards also use a 100mm fan on the board itself to cool the power delivery system, exhausting air out the rear of the card's metal shroud. The GTX 1080 Hybrid has been available for a little while now, and its clock speeds match those seen in EVGA's Classified and FTW models: a base clock of 1,721 MHz with a boost of 1,860 MHz. The GTX 1070 Hybrid is completely new, and its clock speeds – a base of 1,607 MHz and boost of 1,797 MHz – match the corresponding GTX 1070 FTW. Both cards use ten-phase power systems with dual 8-pin PCIe power connectors, so there should be a bit of overclocking headroom available to push these cards above their factory overclocks. We're also seeing a dual-slot design, despite the inclusion of the liquid cooler that sends most of the heat to the radiator. 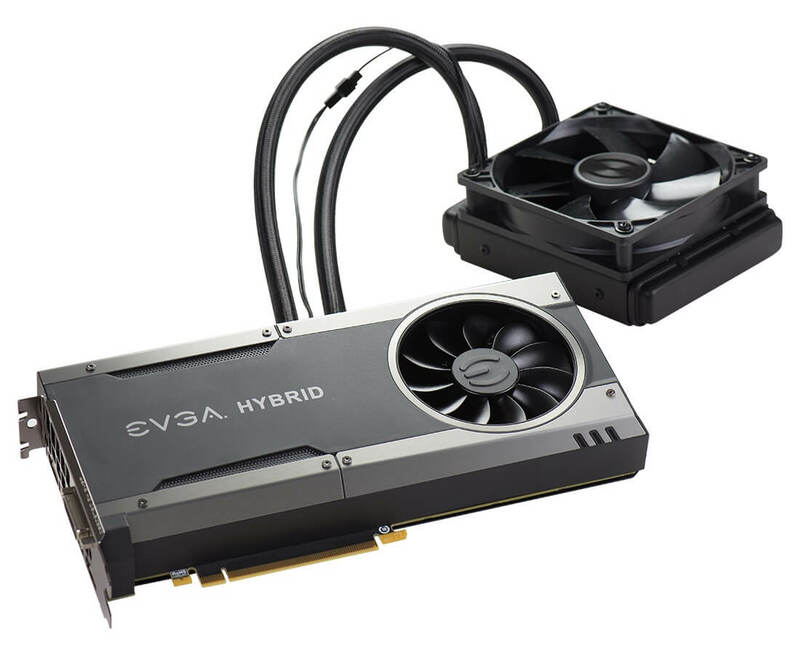 As you might expect, the inclusion of the closed-loop liquid cooler increases the price of EVGA's graphics cards significantly over their standard MSRP. The GTX 1070 Hybrid is available now for $499, while the GTX 1080 Hybrid will set you back $729, a premium of around $130. Surprisingly low factory OC. Guessing they want the end customer to do it? If not, the only advantage I can see here is the less noise - and I'm not sure that is worth the premium they are asking for. Maybe - it's not like you get rid of the fan, it's just not in the card anymore. A bigger fan on the card would never work - because you can't make the card bigger. But with liquid cooling you could make the radiator much bigger, spread out the coolant (heat) over a larger area, use a slower but bigger fan and have a top end card cooled at very low decibels. Just a thought, EVGA. Water has a MUCH higher thermal capacity than air, and pumping it moves energy faster than it can travel through metal (in the form of heat). This is why liquid cooling is so effective and popular. You're able to move more heat away from the processor, and into a more 'thermally-convenient' heat sink with a much larger surface area. They could have put a 140mm fan and radiator on it, but they would have limited their market because fewer cases offer 140mm mountings. Honestly, 120mm is probably more than enough to keep even the 1080 cool. I don't see this selling all that well, especially since at the price premium they want, you can do a basic loop for your GPU yourself - and hook it into a fancier full-system loop at a later date. Considering that most 1080s and 1070s hit the same OC ceiling, no matter what cooler is on it, there isnt much point to these cards. A decent air cooler will OC just as well as one of these water coolers. Yes my card 1080ftw reached ceiling while under 65c so what's the point. LOL 729$, good luck with that. So do I call in a plumber when my graphics card springs a leak. Sorry, but water-cooled computers are a thing of the past, almost out of view in my rearview mirror.